Whaler demonstrating a harpoon gun in Norway. WWF's goal is to ensure that healthy populations of all cetacean species (whales, porpoises and dolphins) occupy their historical range, and remain part of a healthy ocean ecosystem. We work at a local level and across a broad range of international organisations to address and reduce threats to cetaceans. In doing so, WWF acknowledges the widely varied cultural attitudes toward the conservation and management of whales. We work to minimise negative human impacts from commercial exploitation, marine pollution, climate change, ship strikes, fisheries bycatch, noise pollution, and other human-caused threats. WWF opposes commercial whaling, now and until WWF is convinced that the governments of the world have brought whaling under international control, with a precautionary and conservation-based enforceable management and compliance system adhered to by the whaling nations. And we continue to oppose the resumption in international trade in whale parts and products. Over 30,000 whales killed since IWC moratorium. (1986-2007). Click here to enlarge. Under another provision of the International Convention on the Regulation of Whaling, some nations have continued to hunt whales using the "scientific permit" exception. This system allows nations to grant their whalers permits to conduct scientific studies, with the express understanding that the whales taken should be "processed" "so far as practicable". In this way, whales may be taken and their meat and products commercially sold. Accusations have been made that Japan is using scientific permits as a way around the moratorium. Japan and Iceland are the only two countries that currently use this provision. Japan has been engaged in scientific whaling since 1987, a year after the IWC moratorium on commercial whaling began. Iceland recently began "scientific whaling" in 2003 before resuming their commerical hunt in 2006. These countries claim that the catches are essential to obtain necessary information for research and future cetacean management. 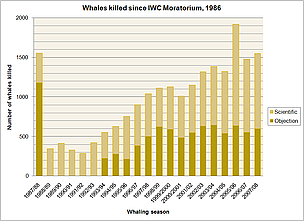 More detailed information on the number of whales killed since the IWC moratorium began in 1986. 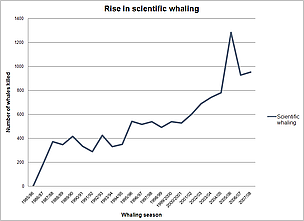 The rise in scientific whaling from 1986 to 2007. Click here to enlarge. Re-opening the international trade in whale meat and blubber is likely to provide an incentive for increased whaling, resulting in more nations resuming whaling and ultimately to more whales being taken. Even a limited legal trade in whale meat could encourage "pirate" whalers to step up unregulated whaling operations. WWF has serious concerns over the risks of whale meat from illegal whaling operations being laundered into any future legal trade. With some whale populations only beginning to recover, and others still on the brink of extinction, any intensification of commercial whaling could have serious consequences. TRAFFIC, the wildlife trade monitoring network, is a joint programme of WWF and IUCN - the World Conservation Union, and works to ensure that trade in wild plants and animals is not a threat to the conservation of nature. Read the CITES resolution on the international trade of whale meat. The 2005/06 season was the first time Japan had taken fin whales, an endangered species. In the 2006/2007 season, Iceland took 7 fin whales and 1 minke whale under its commercial whaling programme. Norway broke the moratorium in 1993 and resumed commercial whaling. Since then they have taken over 6,879 minke whales under objection.